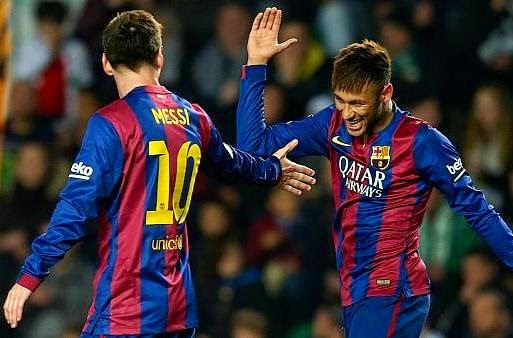 Barcelona forward Neymar claims playing alongside Lionel Messi has helped improve as a footballer. Brazilian Neymar has claimed 22 goals in all competitions this season, already nine more than his total haul last term. Barca’s new attacking triumvirate of Neymar, Messi and Luis Suarez is really starting to show signs of promise, the trio scoring combined 59 goals for the club in all competitions so far. Speaking in Doha yesterday at the launch of a second TV advert celebrating the partnership between Barcelona and principal shirt sponsors Qatar Airways, Neymar also revealed he doesn’t feel any stress playing for the Blaugrana or Brazil. Neymar is idolised in his homeland and an entire nation pinned their hopes of World Cup glory on the young frontman’s shoulders when it hosted the 2014 tournament. Neymar appeared alongside Gerard Pique at the Four Seasons hotel in Doha as the airline jointly revealed an exclusive 60-second preview of the new commercial which will air worldwide from next week. In the ad, Neymar, Pique, Messi, Suarez and Andres Iniesta visit a number of destinations within the airline’s global network, including the Maldives, Dallas, Paris and Seoul [Sport 360].